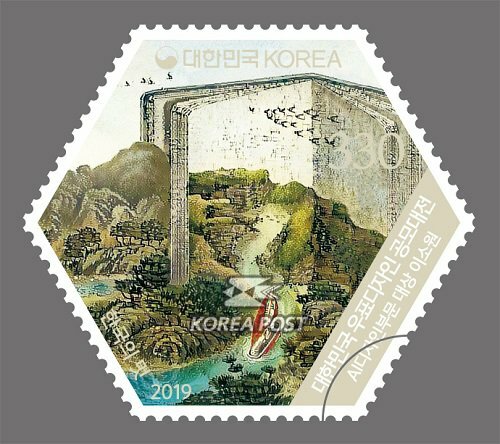 (News from 우정사업본부 / KoreaPost) On 23 January 2019 KoreaPost released a series of five stamps showing the winning designs for the 2019 Korea Stamp Design Contest. 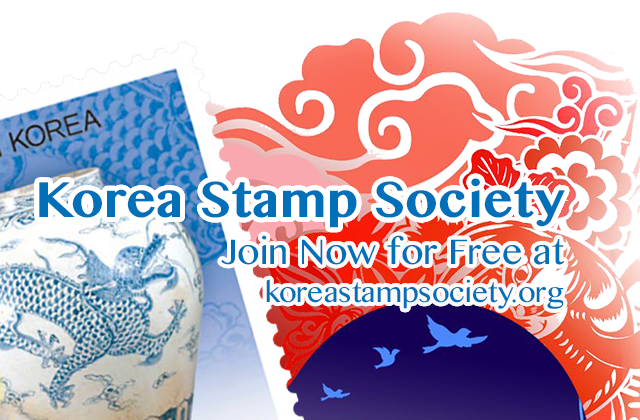 Korea Post has held a Postage Stamp Design Contest every year since 1991 with the aim of increasing the interest of all people for stamps and to highlight the diversity of the design of postage stamps. 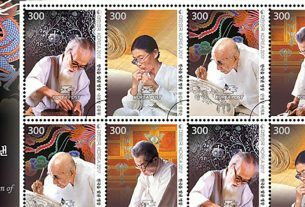 This Contest 2018 suggests communication and win-win as its key points which are important to modern people and are the theme of the general section. 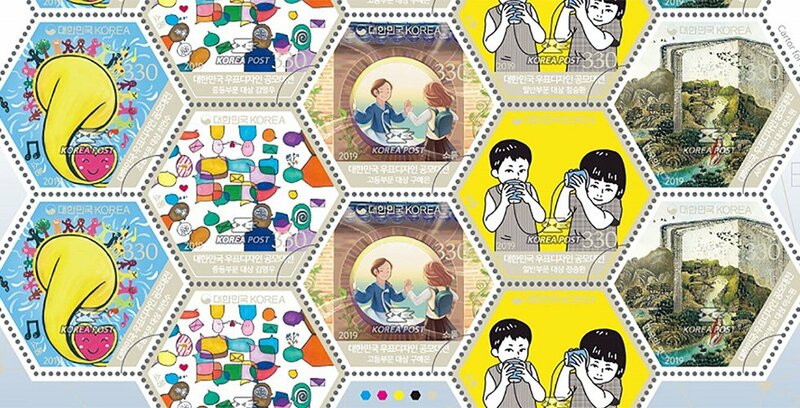 The elementary school category grand prize is Beautiful Communication with one voice harmonized by people, animals, and nature (Choi Yeonsoo, Yangyeong Elementary School in Seongnam) that interestingly draws a mind which collects the live sounds of life in a trumpet and turns anddelivers them into the beautiful sound of love. to understand and the belief to respect other people s words. 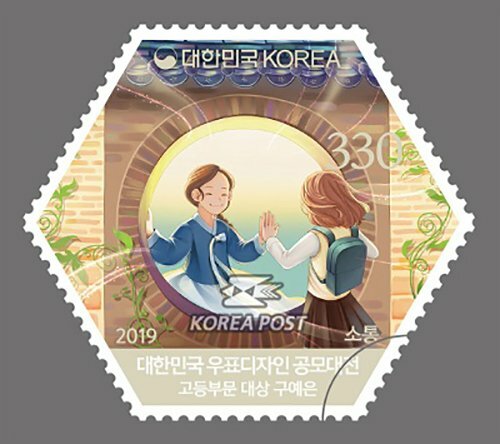 The high school category grand prize is Communication Over Time (Gu Yeeun, Shinil Girls High School in Daejeon) that draws an imagination which reaches communication over time as the Manwol Gate of Changdeokgung Palace is set as the channel of communication between the past and the present as the girls hold each other s hands. 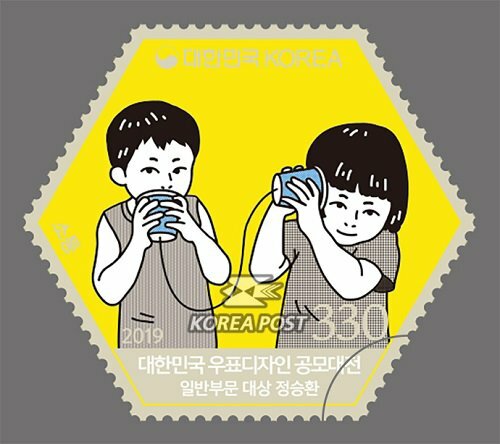 The general category grand prize is Paper Cup Telephone(Jeong Seonghwan, Seoul Institute of the Arts) that draws a memory lane made of a toy telephone by connecting a thread between paper cups in his childhood and delivers the true meaning of communication through the children s pure mind. 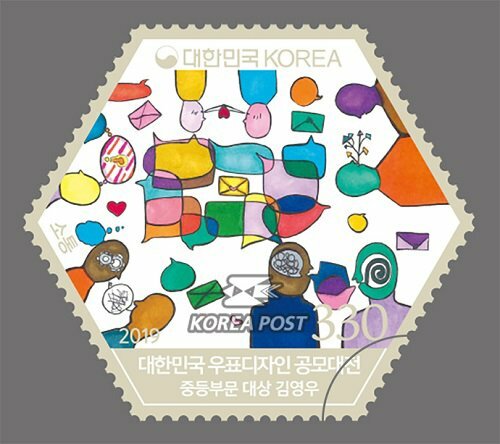 This contest received a flurry of interest as it newly established an AI Design category which brings the AI technology of representing the 4th Industrial Revolution Age as well as a general category into stamp design. 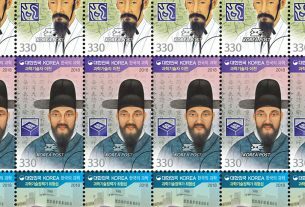 This AI design category converts pictures that represent The Beauty of Korea as the key word into the style of painter Kim Hongdo with AI software, and then submitted it to this contest. 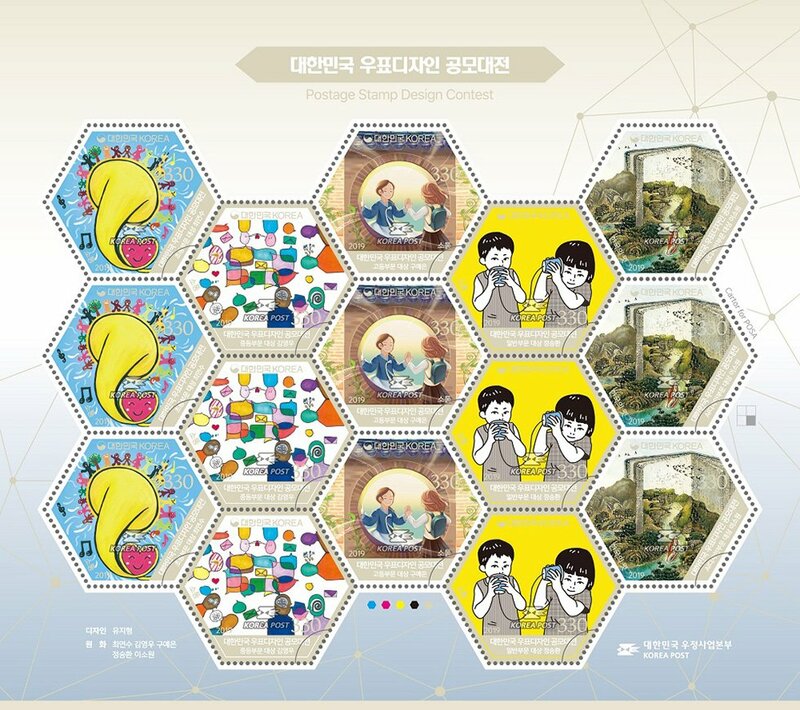 The AI design category grand prize is The Path into Living Free from Worldly Cares (Lee Sowon, Kyunghee University) that converts a picture which goes around the landscape painting in the same way that nature moves around the cut-and-dried life which is symbolized through a book in thestyle of painter Kim Hongdo. 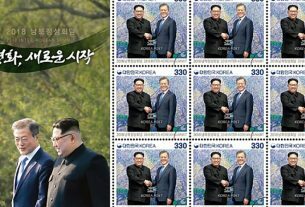 Kunt u mij helpen om de nieuwste uitgiftes Zuid Korea aan te schaffen voor mijn Webwinkel ? 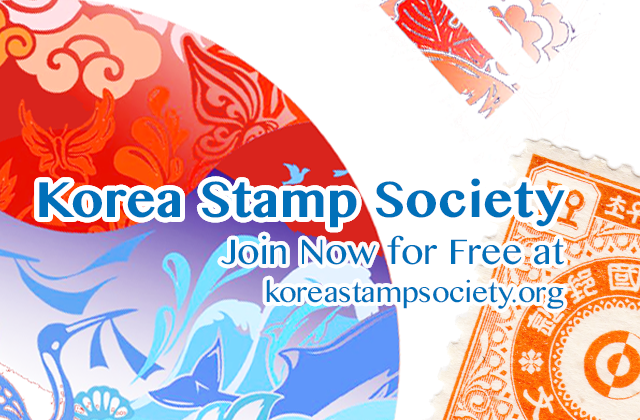 All new KoreaPost stamps can be bought directly from KoreaPost by visiting their (English) website: http://koreastamp.go.kr/ Their email address is: phila@phila.or.kr. Thanks but I already tried to do that.